MELBOURNE, Australia— Telstra recently installed a complete AMX by HARMAN AV control solution in Deakin University’s new Telstra Trading Room, a realistic stock exchange simulation located on Deakin’s Melbourne campus. Established in 1974, Deakin University is one of Australia’s fastest growing research universities, winning numerous awards and consistently ranking among the top universities in Australia. 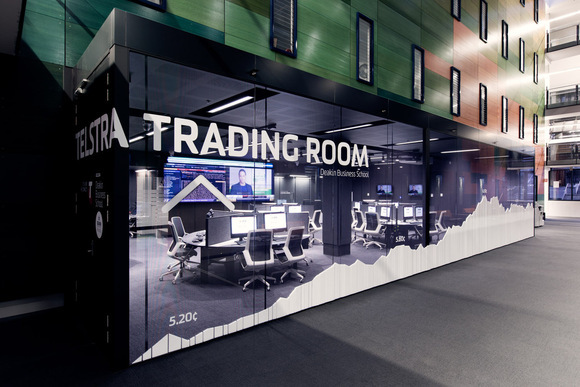 In order to provide its business students with real-world insight into the workings of a live stock exchange environment, Deakin Business School partnered with Australian communications provider Telstra to create a simulated trading room complete with tickers, displays and a large video wall providing real-time finance updates. The AMX NI-4100 control system provides simplified operation of the complex AV system via two AMX Modero X-Series touch panels and two AMX eight-button keypads. The 20-inch Modero touch panels give users the space to perform multiple tasks simultaneously—from selecting video signals for individual or combined sections of the video wall, to controlling the pan and zoom of the HD PTZ cameras. The AMX keypads allow users to select real-time content for four additional 42-inch LCD panels.